In order to gain your full driving licence, it is necessary to pass the Driving Standards Agency theory test and hazard perception test as well as the driving test itself. The theory and hazard perception tests take place in one sitting and both must be passed at the same time before you are permitted to move on to book a driving test. As you may be aware, the theory test is a 50-question multiple choice exam requiring you to answer 43 questions correctly within 80 minutes. The hazard perception element consists of 14 video clips and within each video clip you are expected to click your computer mouse when you see a situation developing which is likely to cause you to take action, such as change speed or direction. The quicker you respond, the higher your score will be. The hazard perception test has not been designed to trick you in any way and pupils with on-the-road experience usually find the exercise quite straightforward. While most pupils are able to study at their own pace and in the comfort of their own home, some still require clarification on certain topics. We have therefore set up a theory test helpline so that you can ring in with any queries arising from your theory test training. 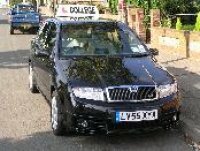 This will leave the valuable time spent in the car with your instructor free to learn to drive. For further information, email us or ring us on 020 8289 2998.